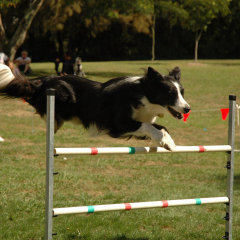 Waikato Agility Group is one of New Zealand’s leading dog agility clubs. 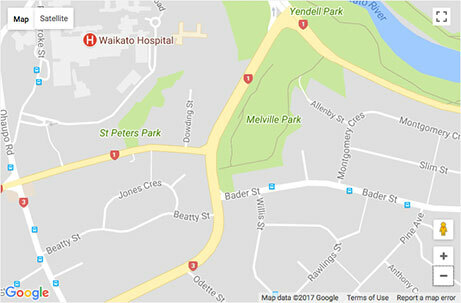 Offering training from beginner through to advanced, WAG has been operating out of Melville Park for the last 20+ years. Several of New Zealand’s top dogs and handlers are based at WAG and pass their knowledge onto new members. 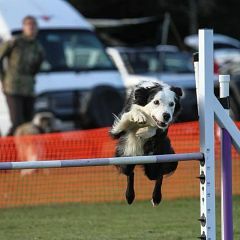 We run training classes throughout the year and run 3 agility events a year that attract entries from across the North Island and beyond. 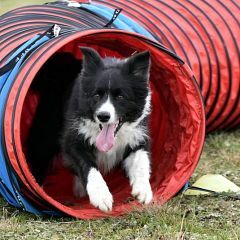 Come and visit us on a Thursday night and check out how much fun you and your dog could have learning agility at WAG! 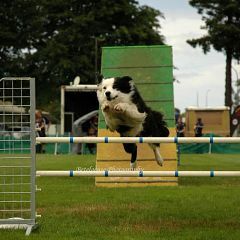 Rain is a black and white border collie who gained her champion and grand champion titles in both agility and jumpers between April 2009 and November 2012. She was bred by Kim Orlando-Reep of Relko kennels, and owned and handled by Keri Neilson. Rain retired from agility in 2015 when she was 10 years old and is now 13 and enjoying an active retirement. 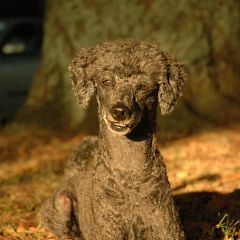 Geuse (pronounced juice), owned and loved by Caitlin Frater, is a toy poodle from Loverslane Kennels. 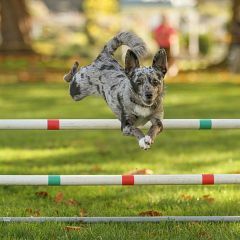 Geuse gained his Jumpers Grand Champion title in August 2014, followed by his Agility Grand Champion title in November 2014 - he is Caitlin's first dog and she did not expect to achieve so much with him! While he may be small, Geuse believes he is a border collie due to growing up with his border collie brothers, Pac and Rebel. Geuse has received over 140 challenges to date, and Caitlin hopes their partnership will continue for a while yet. Deo is a fox terrier cross (something small.... possibly a Chihuahua?) 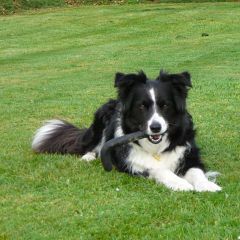 who think's he's a border collie. He's a pretty unusual looking wee guy, there aren't many merle small dogs around! He made up to Jumpers champion in August 2016, and then grand jumpers champion in January 2017. 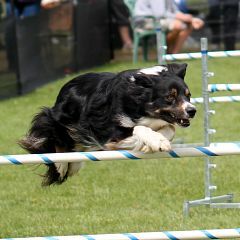 He compete's regularly with his border collie family, and is the proud team member of Kelly Daniel. 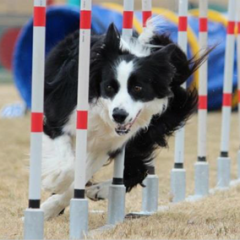 Edge is a tricolour Border Collie who gained his Agility Champion title in September 2013. Born and raised in the Waikato, Edge is from the very successful Rainstar Kennels and joins his mother and two brothers in gaining their champions title. Edge was handled by Nick Chester, and is Nick's first champion. Edge unfortunately had to retire after a number of injuries curtailed his agility career, but he still enjoys attending training and events. GrAgCh Heeza Loose Cannon has certainly lived up to his name. Cannon was very noisy on course, but was extremely focussed and competitive. He was a dog that many people would stop to watch – partly because he was so noisy it was obvious he was on course. He had a number of stellar achievements with wins at National Events, competed in the Australian Nationals in Adelaide in 2007 where he qualified for finals, and won the Champ of Champs at the Auckland NDTA in 2007. 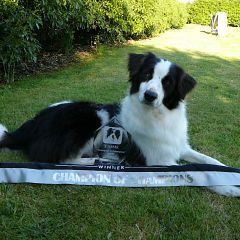 Cannon gained his Grand Champion title in January 2008. He was retired just before he turned 8 due to injuries, but is still enjoying life and is quite active at 14. Cannon is owned by Fiona Ferrar. GrAgCh and GrJCh Rainstar Shark Attack gained his grand champ titles in November 2014 and August 2015 and is owned by Fiona Ferrar. Sharky is an extremely honest wee boy, and loves to work. He also did flygility, and stopped competing when just a few points shy of his FlyChamp title. He had wins in senior 3 NZDACs in a row including having the fastest time out of all heights. He suffered a bit with his handler Fiona Ferrar using an older handling system, but after a visit to the USA, and a change in handling system, a lot more challenges came his way. He retired at the age of 9 with over 50 challenges, and most of them were in the last 3 years of competing. GrAgCh and GrJCh Rainstar Barracuda is owned by Fiona Ferrar, and a more super cuddly boy would be hard to find. He spends his nights under the covers in Fiona’s bed, and is a wonderful hot water bottle. He also loves to work, and has gained challenges with several other handlers as well. 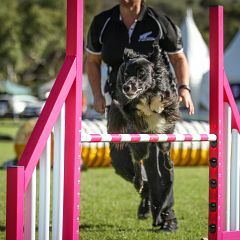 Cuda competed in Australia in 2016 with several wins and qualified for the finals at the National Show. The highlight of his trip was the prizegiving when he ended up lap crawling over several of the Australian judges. 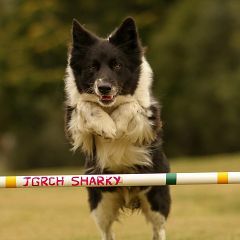 Flick, AgCh JGrCh Relko Thunderstruck ADXS is a black and white Border Collie from the Relko kennels born in May 2005. Flick is very high drive and is only now starting to slow down, she lived for agility and is one of those dogs that would never stop trying. 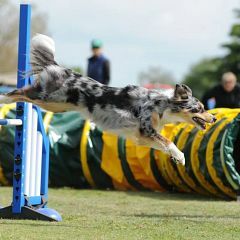 She was trained and handled by Tane Desmond, and was his first agility dog. 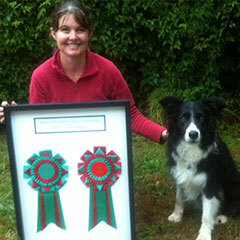 She had a very successful career including winning Champ of Champs at the NZDAC, various wins at national dog shows but her finest achievement is being made up to Jumpers Grand Champion and never being beaten on a clear round (every clear round was a first place challenge) – something that has never been done before in NZ. Yahtzee – AgCh Relko Roll of the Dice, is from the Relko clan, litter mate to Bevan’s Kasey. Owned and Handled by Keri Wheaton. It’s taken a little while to gain our first championship title, January 2019, with Yahtzee just turning 9 a few weeks before, I put this down more to handler error over dog error. “Great dog shame about the handler” Yahtzee has always been a bit of a worrier, with anything, Obedience, the Vet, anything new, won’t do anything with anyone else (literally) she will take as many pats, treats and fussing as you will give loves people but ask her to do something and she’ll be gone. Tried Obedience but too much of a worrier in the ring, but we did get CDX. Put her in front of agility gear (but only with me) and nothing will bother her. She loves agility would do it all day if she could.